Transoms and brackets complement gables, while columns define a welcoming porch. Service entries from the garage, deck and utility/mud room create convenience. 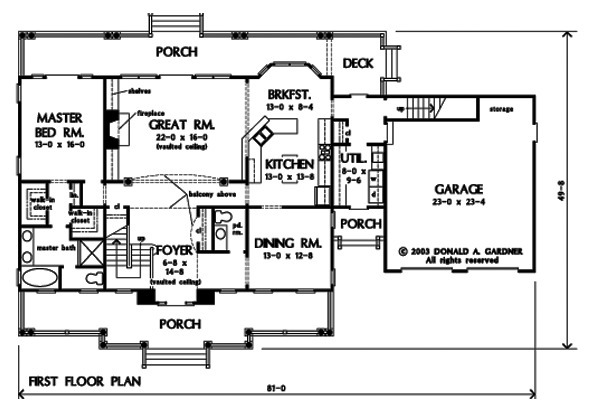 A curved balcony separates the two-story foyer and great room, while custom features include built-ins and shelves. A bonus room offers versatility, and outdoor living space is abundant. 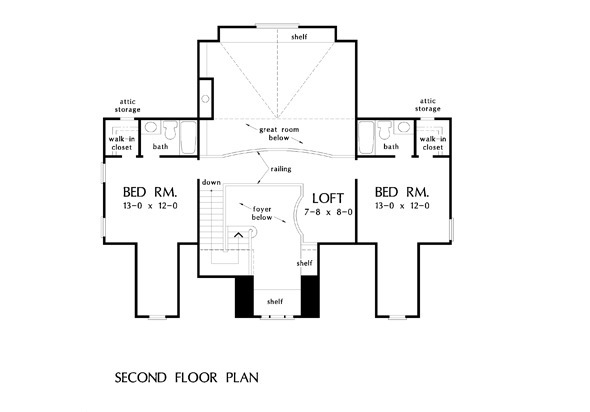 2nd Floor: 799 Sq. Ft. 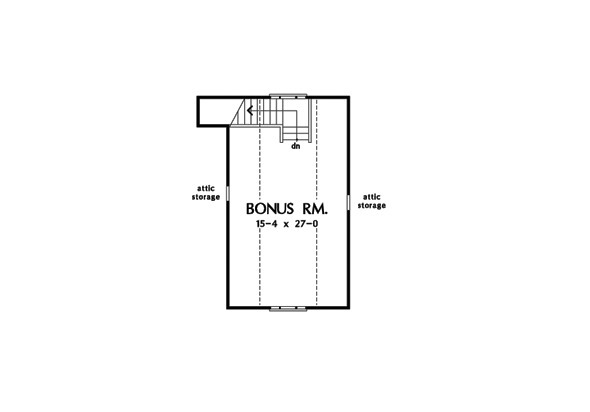 Bonus Room: 457 Sq. 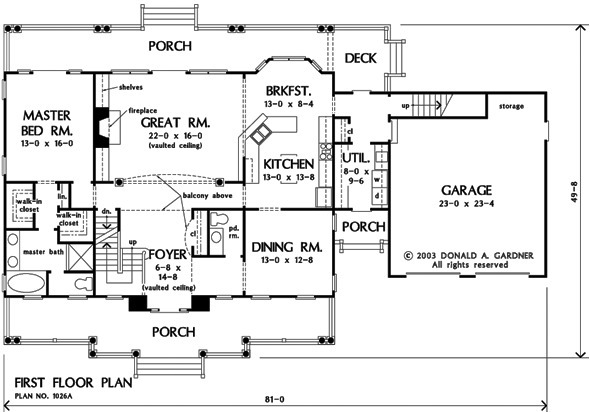 Ft.
House Dimensions: 81' 0" x 49' 8"
Great Room: 22' 0" x 16' 0"
Great Room (Vaulted): 22' 0" x 16' 0" x 18' 0"
Kitchen : 13' 0" x 13' 8" x 9' 0"
Breakfast Room : 13' 0" x 8' 4" x 9' 0"
Utility Room : 8' 0" x 9' 6" x 9' 0"
Bonus Room : 15' 4" x 27' 0" x 8' 0"
Garage : 23' 0" x 23' 4" x 0' 0"
Garage Storage : 8' 6" x 3' 8" x 0' 0"
Master Bedroom : 13' 0" x 16' 0" x 9' 0"
Bedroom #2 : 13' 0" x 12' 0" x 8' 0"
Bedroom #3 : 13' 0" x 12' 0" x 8' 0"
Porch - Front : 49' 4" x 7' 0" x 9' 0"
Porch - Rear : 49' 4" x 7' 0" x 9' 0"
Porch - Right : 8' 0" x 5' 0" x 9' 0"
Deck / Patio : 8' 4" x 10' 0" x 0' 0"
Foyer (Vaulted): 6' 8" x 14' 8" x 18' 0"
Dining Room : 13' 0" x 12' 8" x 9' 0"
Loft / Study : 7' 8" x 8' 0" x 8' 0"